In 2006, Guy Fieri premiered his first show, Guy's Big Bite, on Food Network after winning season two of The Next Food Network Star. Today, this “culinary rock star” hosts two additional top-rated shows on the network: Diners, Drive-Ins and Dives and Tailgate Warriors. And on March 14, 2010, Guy made his debut as a game show host on the NBC prime­time series Minute to Win It. In 2011, Guy officially launched CWK (Cooking with Kids;), a program that encourages developing healthy eating habits to address the childhood obesity crisis, strengthen the family unit by sharing quality time in the kitchen, and as a result increase our children's self-esteem in a fun and positive way. 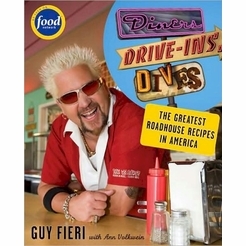 Guy's first two books were the New York Times bestselling Diners, Drive-ins, and Dives: An All-American Road Trip . . . with Recipes! and More Diners, Drive-ins and Dives: Another Drop-Top Culinary Cruise Through America's Finest and Funkiest Joints. Guy owns five restaurants in Northern California, including three Johnny Garlic's and two Tex Wasabi's, and resides in Northern California with his wife, Lori, and two boys, Hunter and Ryder.